BusinessWeek reporter Sheelah Kolhatkar provides us with a very interesting inside look at the fundraising techniques of someone who operates among the wealthy and superwealthy. 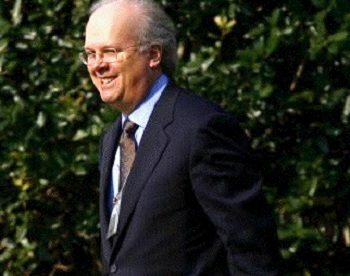 Kolhatkar somehow got invited to an exclusive breakfast briefing by Karl Rove at the Tampa Club during the Republican National Convention. With an invitation by one of the 70 or so donors in the session, she got to be the proverbial “fly on the wall,” watching Rove’s fundraising update for the likes of hedge fund guy John Paulson (number 61 on the Forbes list of the world’s billionaires with a net worth of $12.5 billion) and investor Wilbur Ross (ranking at number 578 with a net worth of $2.2 billion). Kolhatkar writes about Rove’s hour-long conversation with donors in some ways that might resonate with some nonprofit fundraising challenges and in other ways that are like the problems of another planet. Why tamp down the wingnuts like Akin? Rove told the assembled billionaires that “[t]he people we’ve got to win in this election, by and large, voted for Barack Obama.” Unlike the tropes one hears from right wing ideologues, Rove knows that running hard to the right might get a Republican candidate through the primaries, but it’s a dead loser for the general election. You can see that in Romney’s acceptance speech, which soft-pedaled his positions on abortion rights and marriage equality. Rove told the donors about polling data on strategies for defeating Obama, avoiding personal attacks that won’t resonate with “undecided, persuadable” voters: “If you keep it focused on the facts and adopt a respectful tone, then they’re gonna agree with you.” The facts, of course, are debatable; Rove is referring to “facts” that compare what Obama said he was going to do as president versus what he actually did, not the more dubious facts vice presidential nominee Paul Ryan used in his convention speech, which have been fodder for enthusiastic political fact checkers. According to Kolhatkar, Rove barely mentioned Mitt Romney. The focus was on defeating Obama, not electing Romney. Witnessing Rove’s show is like watching a master class in politics, much more powerful than the silly “Newt University” that the RNC allowed Newt Gingrich to hold at the convention. Like a surgeon identifying healthy and vulnerable parts of the body, Rove dissected Republicans’ chances for senatorial victories, suggesting that Republicans can pick up at least three of the seats up for grabs in Nebraska, North Dakota, Wisconsin, and Virginia. He also suggested that Linda McMahon, the spouse of World Wrestling Entertainment owner Vince McMahan, was running a “really smart campaign”—maybe having learned from Rove’s excoriating her when she last had the nomination—which could lead to a Republican victory in that race.